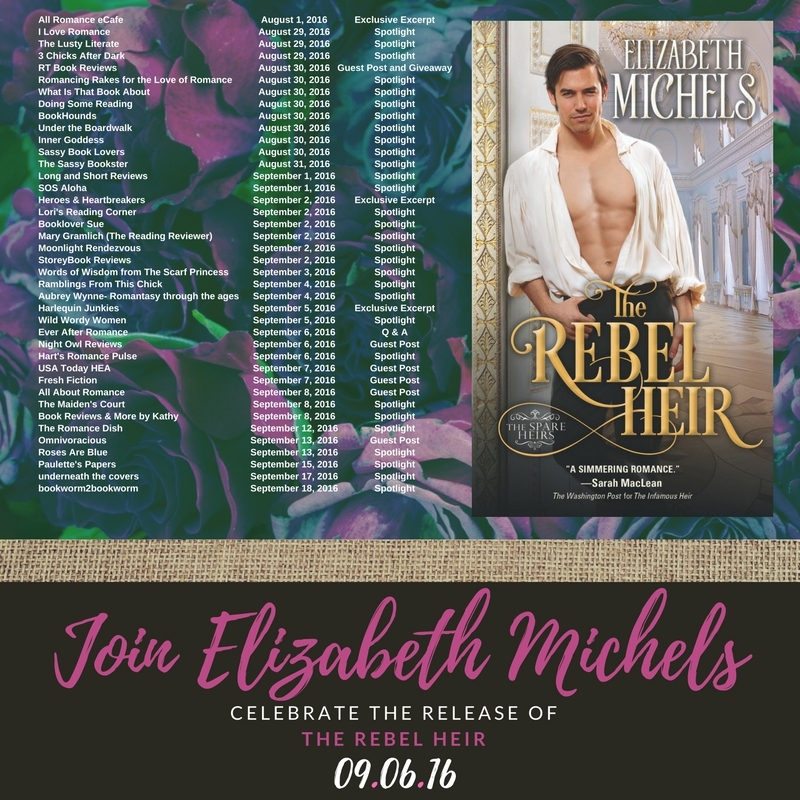 Elizabeth Michels​ is the award-winning author of the Tricks of the Ton series and the Spare Heirs series and one of my favorite new historical romance authors. I finished her new book, The Rebel Heir late last night and it's wonderful. I've enjoyed everything she's written but this one is, in my opinion, her best work to date. I adored both Ash and Evie and the sometimes humorous, sometimes heart-wrenching, and, ultimately, satisfying journey Michels gave them. There's a scene near the end that is one of my all-time favorite scenes in any novel I've ever read. I don't want to give away spoilers so I'll just say that daisies have always been my favorite flower. 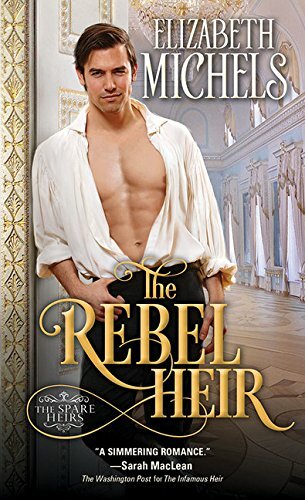 I hope you'll all read the The Rebel Heir and enjoy that scene - and the rest of the book - as much as I did. Now, here's Elizabeth Michels! Hi, everyone! Let’s play a game! Since deception is a key ingredient in THE REBEL HEIR, the second book in the Spare Heirs series, I thought it would be fun to play two truths and a lie. Do you know how this game works? Ash Claughbane is here to tell you three things about himself and one of them is a lie…Yes, just one. *gives Ash the side eye to keep him honest for a few minutes* Can you guess which fact isn’t true about Ash? Good Luck! I’m from the Isle of Man. There was a time when my family had an estate, a vast home overlooking the sea, servants, gardens... There was a time when my mother and father were alive and that home was intact. There was a time when my three older brothers calling me by my given name of Ashley was my largest problem—there was an unfortunate rhyme that accompanied it, that I won’t repeat here. But that was before Lord Rightworth took everything from us, and I vowed to get it all back. I may be from the Isle of Man, but I haven’t been back there since. I’ve been traveling by carriage with my driver, Stapleton, for company for seven years. I move from town to town, never staying long enough to unpack my trunks. My business has thrived, and rightfully so. I am quite skilled at it. You see, I sell people what they desire, anything they desire. Everyone wants something and it just so happens, I have that something bottled and in my carriage. I made my way through all of Wales where my brothers were less likely to find me, then I began moving through southern England. That was when he found me, not my eldest brother, the new duke, thankfully, but Fallon St. James. He invited me to join a secret club of title-less gentlemen in London called The Spare Heir Society. I’m not one to join anything at all. I have no need of any sort of brotherhood having abandoned my own brothers long ago. I told St. James as much and yet he gave me his calling card. Stranger still, I kept it. Now I’m in London, with a room in St. James’ peculiar home and headquarters. My clothing remains in my trunk, but I’m here, newest member of The Spare Heirs Society. My name is Lord Crosby, purveyor of hope for the future. I’m a forward thinking gentleman, a visionary some might say. In a year or two, you’ll remember we met. You’ll remember that I told you that your farming techniques and way of life were a thing of the past. My steam machines will be in every home. Small enough to be accessible to every family, and big enough to make the way all of society lives a little easier. Imagine the possibilities for the good people of England and beyond. The world is changing and the future of our world is steam. You’ll remember I told you of this. On that day years from now, wouldn’t you like to say you were wise? Wouldn’t you like to say you invested in Crosby Steam Works? “I thought so as well.” He shifted even closer to her, leaning his arm on the wall above her head and surrounding her without the benefit of his embrace to steady her. “If you tell me you want me to kiss you, I’ll kiss you here.” He spoke the words against the sensitive skin beneath her ear before moving down her neck, not touching her, but close enough that she could feel the warmth of his lips. I love the excerpt and can't wait to read it. Thanks for posting. I'll guess and say # 3 is the lie. I'm reading Wedding For A Knight by Sue-Ellen Welfonder right now. I'm a long-time Welfonder fan! I loved the excerpt and am looking forward to reading Ash and Evie's story. I also think No. 3 is a lie. Hope you like Ash and Evie as much as I did, Cathy. Looking forward to reading this book. New series for me. I think the lie is #3. I am currently reading The Surprise Princess by Patricia McLinn. I don't think I've ever read anything by McLinn. Will have to check her out. I am between books at the moment. My next one will be Linda Broday's TO LOVE A TEXAS RANGER, the first book in her Men of Legend series. It seems I split my time between the 1800's American West, the early Highland of Scotland, and historical England.